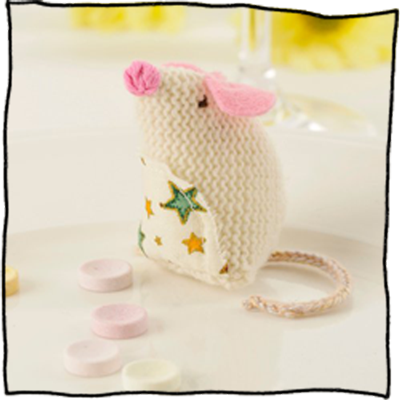 A charming little mouse with a vintage fabric stomach. Lovingly hand knitted in the softest lambswool, the fabric for its tummy can be matched to a Christening gown or special outfit, making this a truly memorable gift to treasure forever. The child’s initial or a special date can also be hand embroidered on the tummy in gold. Use the box below to enter these details. Available in white, pink or blue knitted bodies, the fabric on the tummies will vary, so please type in the box below to let Laura know if you have a particular colour or pattern preference. You'll also see the option to attach a picture file to help Laura match the fabric. It is also possible to use your own fabric, so please contact Laura directly if you would like to do this. Each Baby Mouse is presented in a gift box or bag.